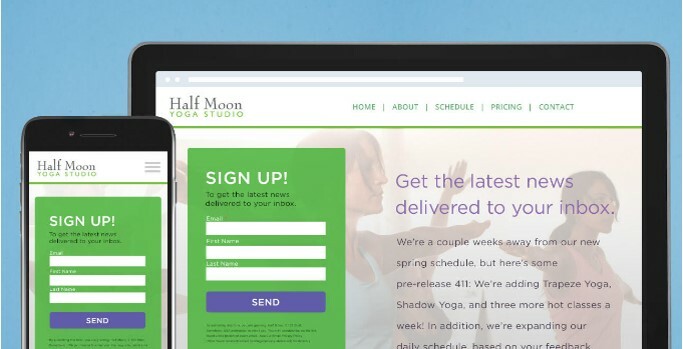 ﻿ How to Do Email Marketing: A Beginner’s Guide » Red Mango Marketing! « What is the ROI of Email Marketing? If you’re just getting started with email marketing, there’s no better time to jump in. Studies show that email marketing continues to outperform other digital marketing channels including social media and paid search. And with an average return of $38 for every dollar spent, investing in email marketing can have some serious payoffs. Figuring out how to do email marketing is the hardest part, one that often stops people from taking the leap, but it doesn’t have to be daunting. The moment you see the results from your first send, you’ll see why it’s worth it. If you’re serious about email marketing, you need to work with an email marketing service provider. Working with a provider is the only way your business can leverage email marketing automation to effectively deliver messages to large groups of contacts or subscribers. 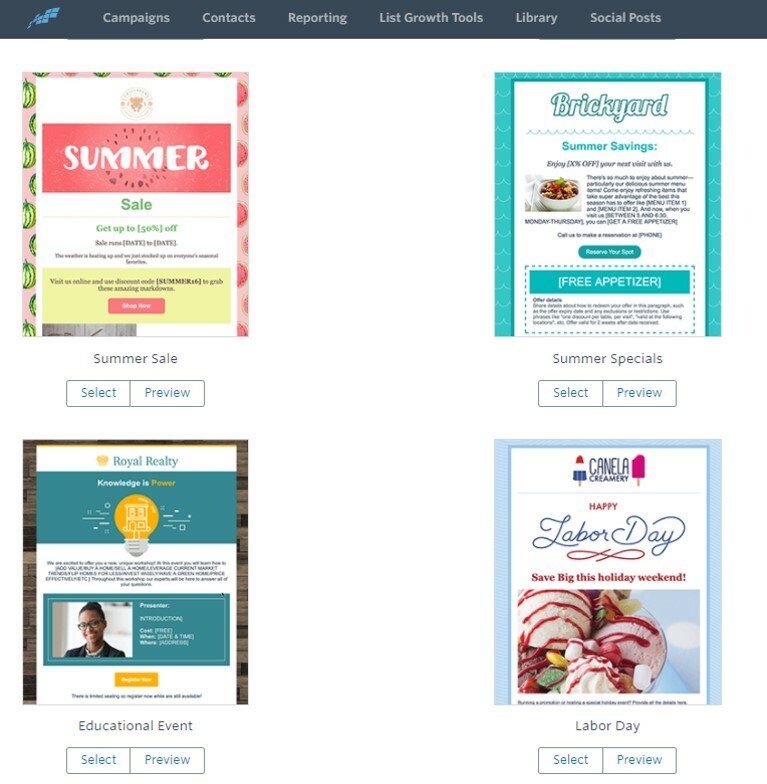 With email marketing software, you’ll also benefit from professional email templates, tools to help you grow and manage your email list, and tracking features that show you who is opening and engaging with your campaigns and messages. Most businesses have some existing contacts to start an email list. Think of the customers and people you already have a relationship with. Maybe it’s the business contacts you email with on a regular basis; maybe you just start with a few supportive friends and family members. Even if you’re building an email list from scratch, don’t get discouraged. Start by putting a paper sign-up sheet near your register, adding an email sign-up form to your website, and encouraging your social media followers and loyal customers to sign up for your email newsletters. Whatever you do, don’t be tempted to purchase an email list. Email marketing is all about building and nurturing relationships; connecting with a smaller list of quality contacts will be more impactful than blasting out messages to contacts that don’t even know your business. Once you have an email marketing account and an initial list to send to, add your contacts into your account. You can start by uploading a contact list from an existing spreadsheet or importing contacts right from a Gmail or Outlook account. 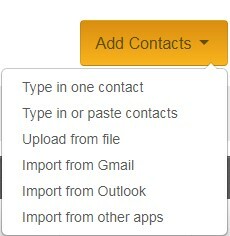 If possible, organize your contacts into separate lists based on what you know about them. For example, if you own a gym, create separate email lists for people who have taken swimming lessons and those who have attended yoga classes. That way you can send out targeted email campaigns based on your subscriber’s specific interests. Your welcome email is the first message your new email subscribers receive from you. Welcome email campaigns are especially important because they serve as your first impression and reach people at a time when they’re highly engaged with your business. You can expect a higher than average open rate for your welcome email, so make sure you’re delivering value right away. Start with a warm greeting, provide an overview of what they can expect to receive from you in the future, and offer them something of value. Once set up, your welcome email will send to all new contacts automatically. This is the fun part! Once you have brainstormed the perfect email campaign ideas, it’s time to put on your creativity hat. Even if you’re not a designer, you can send beautiful professional emails that look good on any device. Constant Contact has hundreds of email templates for you to choose from — including themed templates to stand out during the holiday season. When choosing a template, look for a layout that is clean, eye-catching, and one that easily gets your message across. People scroll through the inbox quickly — often while on the go — so choose a mobile-responsive email template that looks good on any device. Next, customize your template with your brand by putting your business’s logo right at the top of your email and linking the image back to your website’s homepage. Add in your business’s signature colors and create an email footer with your business name, contact information, and links to your active social media channels. Once you have these essential design elements in place, make a copy of your email and save a version as your master template. With this reusable template you don’t have to start from scratch and add in your branding every time you want to send out an email. This tends to be one of the scariest steps for small business owners. I get it — writer’s block happens to the best of us. What usually snaps me out of it is pretending I’m having a face-to-face conversation with someone and writing down exactly what I’d like to say to them. It also helps to follow a repeatable process and break your message down into three important sections. This simple three-step formula helps you stay focused so you can write effective messages fast and keep moving your marketing efforts in the right direction. Your email subject line is one of the most important text in your whole email. Why? Your subscribers see your subject line even before they open your message. Make a good impression and people won’t be able to resist opening. Write something bland and they might skip over your message without a second thought. Your subject line should be short and crisp — around 40 characters. You can draw attention by asking a compelling question, including a deadline for urgency, or just teasing your message. This will ensure that your email stands out in the inbox. 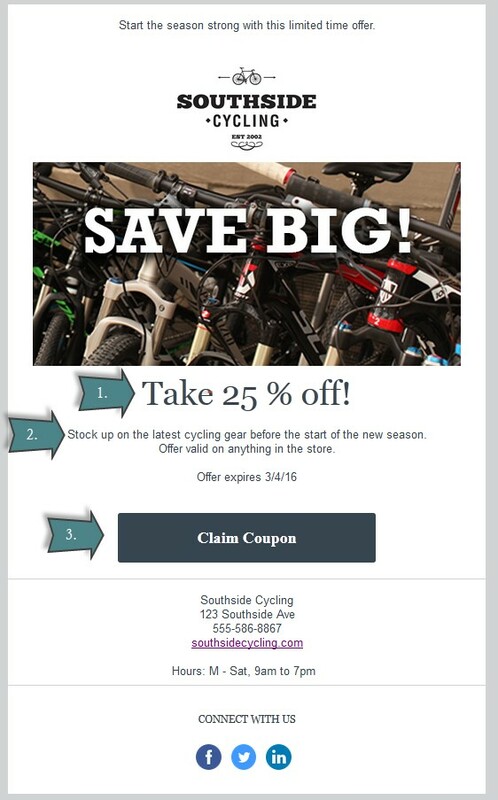 When you’re first learning how to do email marketing, it’s easy to slip up every once in a while. Maybe you forget to add in an important link or make an embarrassing spelling mistake right in the subject line. Unfortunately, there’s no back button with email, so always remember to send yourself, or a staff member, a Test Email before sending it out to your entire list. When you’re ready to send out an email, timing is an important factor to consider. Every audience is different and the best time to send will differ based on who’s on your email list. Based on customer data, we’ve compiled some information on which day and time might work best for your industry. You can also create a consistent sending schedule and stick to it. For example, if you send out a newsletter on the first of every month, your audience come to expect it in their inboxes. Your subscribers will know when they’ll hear from you next and you can schedule your message based on your established schedule. Don’t be deceived — email marketing doesn’t end with a send. You want to track your open rate, click-through rate, unsubscribe rates, deliverability rate, and other important metrics, and work to improve these over time. If you want to see real results from your email marketing, you need a strong understanding of how each email performs so you can make improvements and learn more about your target audience. Spending a few minutes in your email reports will tell you valuable information like who opened your email, who clicked on specific links, and what information was the most interesting to your readers. While it’s important to know how engaging your campaign messages are, make sure you’re tracking actions that happen beyond your emails. How many clicks to your donation page are translating into real donations? What is the total amount of funds raised from a single email campaign? These questions show you the real impact of your email marketing efforts. Feeling more confident in your ability to get started with email marketing? Like most things, email marketing seems overwhelming until you actually give it a try. Now you have 10 easy-to-follow steps to help you hit the ground running with your first email marketing campaign. 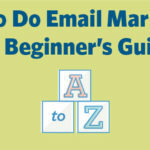 The post How to Do Email Marketing: A Beginner’s Guide appeared first on Constant Contact Blogs. This entry was posted on Thursday, December 27th, 2018 at 8:00 am	and is filed under Email Marketing, News & Updates. You can follow any responses to this entry through the RSS 2.0 feed. Both comments and pings are currently closed.